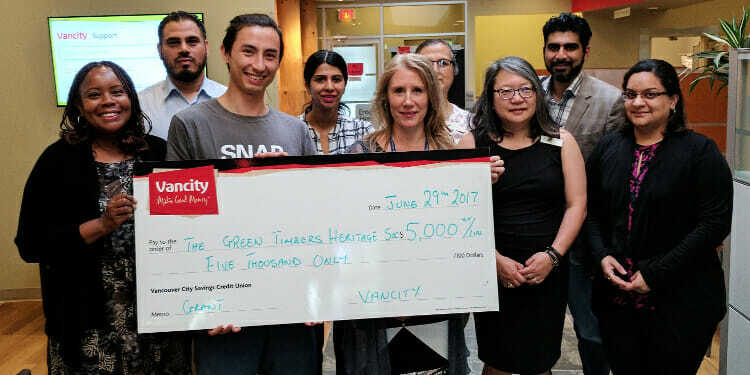 Vancity’s Surrey City Centre Community Branch presented Nathan Ross, program coordinator of the Surrey Natural Areas Partnership (SNAP) with a cheque for $5,000 for a Vancity Community Partnership Program grant. ​To​ ​ensure​ ​the​ ​planting​ ​is successful,​ ​the​ ​area​ ​will​ ​be​ ​revisited​ ​and​ ​maintained​ ​against​ ​recurrences​ ​of​ ​invasive​ ​plants, yard​ ​waste​ ​and​ ​garbage​ ​dumped​ ​in​ ​the​ ​area​ ​by​ ​future​ ​SNAP​ ​employees​ ​as​ ​well​ ​as​ ​the​ ​City​ ​of Surrey’s​ ​parks​ ​staff. To learn more about SNAP visit www.surreysnaturalareaspartnership.com. To learn more about the Green Timbers Heritage Society visit greentimbers.ca.